The room was full of moon shadows and dancing light. But it was the wall around the window that Lucy couldn’t stop staring at, the one with the painting of Spring. It was as bright as a sunny day, and the tiny yellow flowers that covered the fields were moving, as if a breeze had blown through the painting and set all the petals dancing. When her sister is injured overseas, Lucy McKenzie is sent to stay with her Aunty Big in her old country house west of Sydney for a while. At first, Lucy hates the remote location and lonely old house of Avendale, until one night, she finds she is able to walk through one of the beautiful paintings that cover the walls in the dining room and finds herself in a different Avendale, with a strangely familiar young girl called April. Over the next few nights, Lucy is able to move through different paintings into the different seasons of that other Avendale, experiencing bushfires, floods and the advent of war, and discovering amazing things about her own family past and present. Throughout the whole story, Lucy develops a love for Avendale and the beautiful valley surrounding it. The images of the bushland around the house, the river and of Pulpit Rock, up in the hills, are very evocative and it reminds me of childhood camping holidays spent exploring bushland (although we didn’t have any horses to ride!). This story is like The Lion, The Witch and the Wardrobe for Aussie kids. The idea of being able to walk into a wall-sized painting is a brilliant one – I remember being about eight years old myself, wishing I could walk through a picture of a forest covering one wall of a house we stayed in for a short time! I just loved that the old Avendale house was still standing all that time later – it makes me wonder what stood on the site of my own house some eighty years ago – possibly an old house like Avendale! Children of all ages (including grown-up children) will love this story. 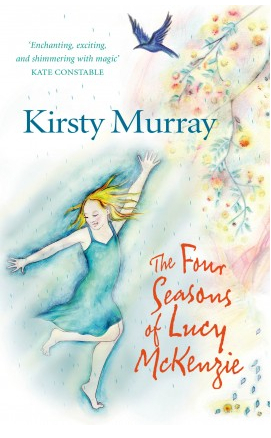 Kirsty Murray writes books for children and teenagers. She was born in Melbourne where she first discovered the power of a good story. Kirsty now spends most of her time reading, writing and hanging out in libraries all around the world. Kirsty’s works includes ten novels as well as many other books for young people. Her novels have won and been shortlisted for many awards and published internationally. Kirsty writes for young people because they are a universal audience. Not everyone lives a long life but every human being was once a child and the child inside us never disappears. I love good MG stories. Sometimes they are the best. This one sounds so fanciful, and fun and mysterious. I am very much looking forward to reading this one, if I get the chance! Oh, and I love the cover. It is very fitting for the story inside it!